This might be the last day I can advocate boycotting yogurt from a West Bank settlement before I am called into the police station and told that I have broken a law. The controversial “Boycott Law” may come before the Knesset today for its second and third readings. If this law is passed, all Israelis who value free speech are doomed. So I hereby want to say that for months I have been boycotting a certain organic goat yogurt that comes from the settlement of Yizhar, not far from Nablus. I have nothing against Yizhar’s free-range goats, which produce excellent milk for the organic yogurt, but Yizhar’s people scare me. They symbolize the most extreme elements in the national religious camp. Their illegal and immoral behavior against their Palestinian neighbors is unchecked, by and large, by the Israreli police and the Israeli army. The Israeli government does nothing to reign in the Jewish extremists. Such extremists brought down the Second Temple and such extremists, if allowed to behave as they have in the past, will bring down the State of Israel. These are nasty words from a birthday girl, but I’m scared. I’m scared because as I grow older, I see the changes. The Israel of 1966 which I loved helped me solve my own Jewish problem. The Israel of 1967 enabled my father to stand tall and be proud of being Jewish, for the first time in his sixty-four years. The Israel of 1973 inspired me to volunteer to work with bereaved families on the homefront. I learned the songs of the Israel of 1980 through my children’s entry into the educational system. I was still a Zionist in 1982, even though I didn’t understand why Ariel Sharon announced we were invading Lebanon for only forty kilometers when my husband was calling me on the phone from Beirut (way more than forty). During the Gulf War I sat in the sealed room and wore the mask. I lived through the traumatic Second Intifada, but now I ask myself, How Much? Until when? I’m scared of living in a society sinking gradually into a monolith of hatred towards the other. I want to call our neighbors neighbors, not enemies. Xenophobia reigns. I am understanding how German Jews watched their society change slowly and still didn’t leave, because it’s really hard to grasp that the place you call home, the place you love, is transforming into someplace unrecognizable. This is not the post I wanted to write on my birthday, but the headline keeps staring me in the face. 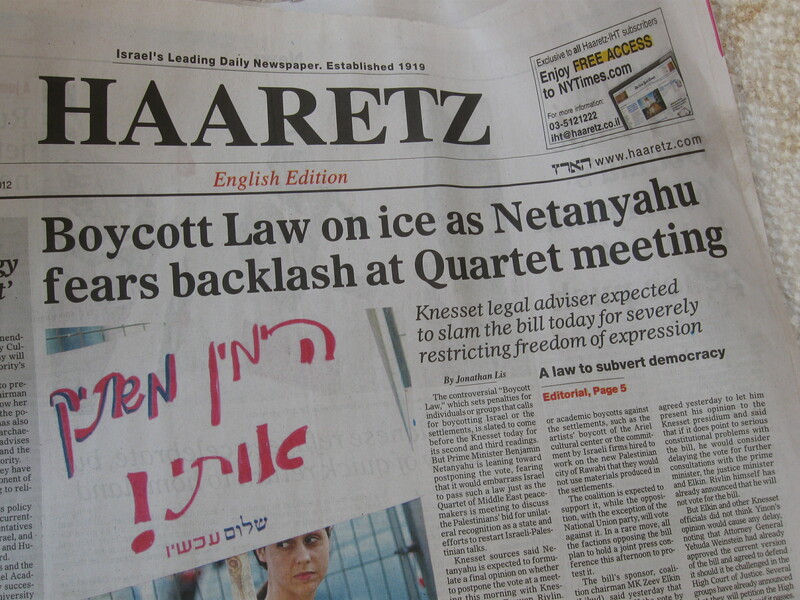 “Boycott Law on ice as Netanyahu fears backlash at Quartet meeting.” The sun is oppresive today, July 11th, as it always is during the month of July. The question is, Can the Boycott Law stay on ice in this heat? This entry was posted in Israel, Uncategorized and tagged Israel Boycott Law. Bookmark the permalink. If I’m not mistaken, the law provides not for criminal charges to be brought but for civil charges to be filed against boycott advocates by anyone who claims to be harmed by the boycott advocated. Not much less of an infringement upon people’s right to free political expression. I join you in refraining from buying the yogurt. Furthemore, I hope the US will begin to require proper labeling (i.e., not “Made in Israel”) for goods made in places under Israeli rule that even under *Israeli* law are not Israel — i.e., the West Bank and Gaza — as I believe the EU already does. ve up my favorite yogurt – a sugarless soy milk product – when I discovered it was made in a settlement. I agree with every word. Sue me! Dear Judy, your posts are always eloquent but this one is also urgently needed. This bill is a blatant attack on freedom, and another misstep down a slippery slope many people running this country are pushing us. See you in jail, & happy birthday! Thanks, Allan, for mentioning my blogpost. I thought Beinart’s article was fabulous and I continue to not buy products produced in the West Bank, even though some of the nicest people I know live there.